Now there’s no need to knot the bag or use clumsy twist ties with the easy-open/close Quick Draw can liner. 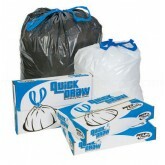 Quick Draw can liners feature a convenient drawstring closure and flat bottom construction which allows you to use the full capacity of the bag. The drawstring helps keep hands clean and creates a handy carry handle. These liners are designed to fit the container without waste, adding more capacity, and are constructed with no bottom seal to help prevent leakage. Uniquely packaged on an interleaved coreless roll for added convenience.